Unique timewarped Optigan / String Synth hybrid! 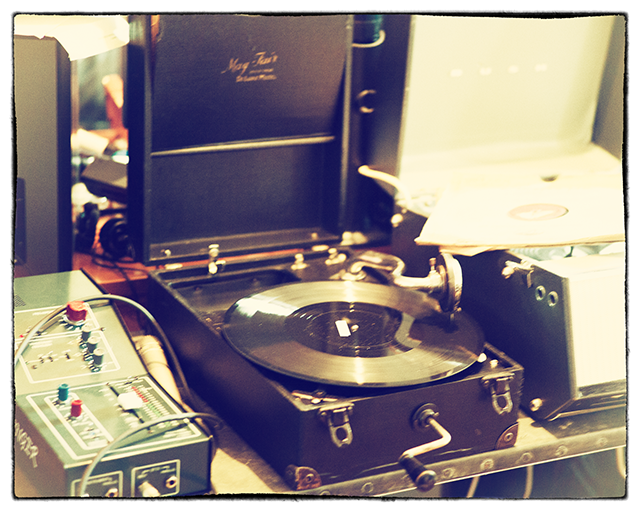 We then replayed these waves off their vinyl LPs on two vintage machines: a 1960s Dansette, and a 1910 hand-cranked portable 78 player complete with steel needle and built-in horn. The result of that process is two completely distinct sets of waves, one more-or-less true to the original sounds (but with a bit of crackle and wobble) and the other a savagely bandwidth-limited, thoroughly antique tone that warbles merrily along whenever you click in the oscillator’s Vintage switch. The interface is where you take those starting points to the next level. You get three oscillators to play with and blend, each of which is freely selectable between the 60s wave and the Vintage version. Each wave has its own amp envelope and tremolo control (which can be set super-slow to allow the sound to fade in and out almost subliminally) plus a very useful high-pass filter. Dial this up high enough and you’re left with very little except hiss and crackle, which can be a great way to add a bit of Vintage character to a tone mainly comprised of two 60s-era waveforms on the other two dials. On the right-hand end there’s a block that ties all three oscillators together using a common Filter circuit (complete with envelope), Valve saturation to push the sound harder, and the twin Needle and Groove controls. Needle controls an initial needle-down thump and simulates engaging the platters whenever you hit a key. 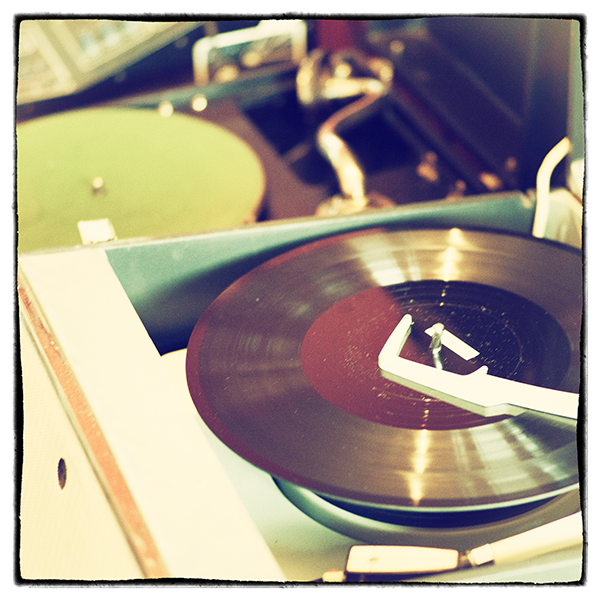 Groove is a constant, 78rpm cyclic crackle sampled from the 1910 turntable and plays as long as you hold a note. Judicious use of these two controls can really help simulate the behaviour of an ageing Optigan-style machine. Plus of course there’s the Glitch control, for instant random patch creation (with a bias towards musically-useful patches). Click it and get immediate fresh inspiration! On the rear panel are echo, reverb and rotary speaker sims plus modelled amp cab, all of which can take the sound in useful new directions very quickly and easily. Platter is, fairly obviously, not a recreation: it’s an entirely original and deliberately oddball instrument. It excels at vintage-themed soundscapes, black-and-white horror movie soundtracks, moody steampunky swells, background music for turn-of-the-century punting trips along the rivers of Cambridge with a Victrola playing in the bow… if you want to timetravel your tracks into another age, Platter is here for you. Platter also plays nicely with others: try layering it with your patch of choice and then adjusting the HPFs so it doesn’t compete, and let it lend a sheen of vintage vinyl airiness to any tone you like. In combination or solo, this is very much the one to reach for when you want a nostalgic sepia filter over your lens! Great sounding vintage instrument. Just used it on a track. Instantly added a new depth. Well done. I had taken some time away from Rhythmic Robot for a little while after indulging in many previous purchases of their crazy instruments. A Christmas gift from Mongo got me to take a look at what they’ve been up to in the laboratory lately. I loved the concept of Platter since I’ve always been fascinated by Mellotrons, Chamberlains, Optigons and the like over the years. 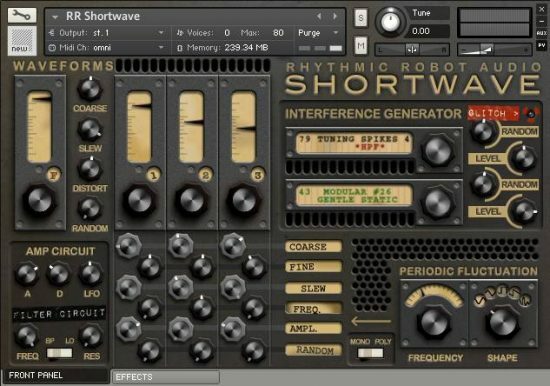 When I fired it up on Kontakt, I was immediately drawn to the stark black and white aesthetic of the interface and surfed through the presets. They were extremely impressive and surprisingly varied. The difference between this and other sample playback sets of Mellotrons etc. 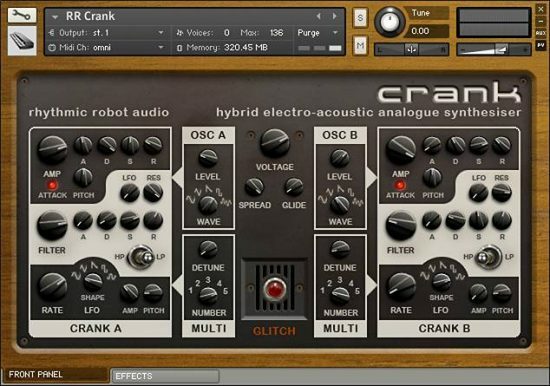 is how organic the sounds feel and the evolving character of the presets as you play them. Many of them interact with your controller’s touch sensitivity beyond just softness and loundness. You can have keyboard and lead sounds with a real attack besides the usual ambient pads and strings. Tweaking the controls can drastically alter the results quickly – be careful moving the dials and knobs. Using the wonderful “glitch” button will show you that this thing is haunted. Practically every push is like excavating an ancient sonic treasure – it’s an infinite source of inspiration. “Glitch” should be on every one of their programs if they can make it part of their extremely reasonable purchase prices (they are many of them already – just do a key word search for “glitch”). If your recordings are sounding too slick and modern, sneaking a track or two of Platter into your mix will rectify that quickly. Mongo’s generosity worked – I purchased this sample set and then went on to explore and purchase a number of new ones over the holidays – you guys are addictive in the nicest possible way. Serve it up, waiter, hours devour. I just love sounds that make your imagination work a little harder. Platter has that far away quality that makes you believe you’re in the past and somewhere else. The little, dirty snippets of contamination are what make the sounds pretty. There is always something moving and shifting in the sound field, which adds a dynamic to the samples that is hard to replicate with ordinary signal processing. Aural fascination in a can. This beast is very vintage sounding. It’s similar to string machines, optigans and mellotrons yet it has a unique character of its own. The band limited sound of the vintage switch is way nastier and vintage sounding than any mellotron I’ve ever heard. Definitely try playing around with random modulation on sample start for some more variation, especially on the groove sample. Platter is otherworldly, dreamy, hypnotizing and vintage sounding. The pitch drifts a lot on the Vintage waveforms, so I recommend adding a random unipolar modulator on Sample Start and turn it way up to avoid getting the same pitch drift every time you play the same note. Great stuff. Unlike spaceman, this thing, while capable of warping your brains out and drifting into a quagmire of pitch, this also has a reliable side, and it’s got that great vinyl top end, without having to add the artificial sheen of “hey look what I did on vinyl.” Also, it has what I love about RR: it has a logic to it’s design that clearly started with “Ooh. This is cool. What if we…” “Hmm. That’s cool, but it also needs to be usable. We should probably…” . And then you get something that’s both quirky and usable. Platter has a great retro-vintage feeling. I like the sounds used as oscillators and the endless possibilities to elaborate them. The groove of the old turnable can be used both as a kind of percussive attack or as a classic background loop. The idea of this instrument is brilliant, and the realization too… it’s one of my favourites! 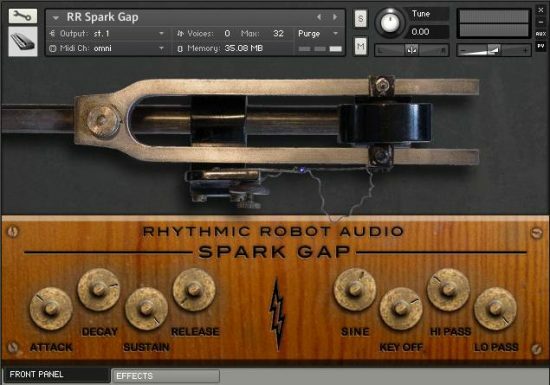 The kind of off the wall instrument you expect from RR really – thank goodness! 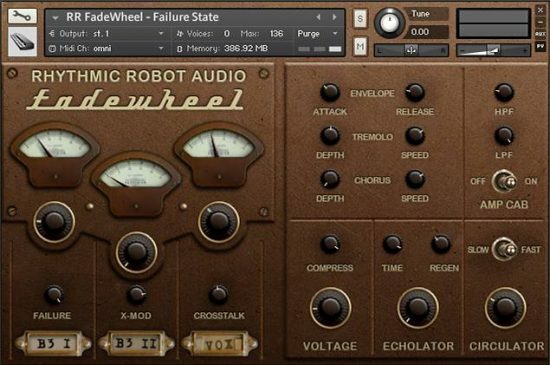 The kind of thing Kontakt was made to do – lovely interface, easy to use. Think, optigan type sounds thrown into the air and blended together – and more blending and mangling is then done from the interface. Floaty, other worldly, atmospheric, haunting, chilling – wonderful. As a big Sparklehorse fan, I am intrigued by anything Optigon-esque and this is one of the better additions to my addiction. Can really make a straight-forward arrangement into something complex, rich and haunting. Hauntingly beautiful and addictive. Whatever it is about a scratchy old needle that captured my attention and imagination, I wasn’t able to stop playing this. I really like the power one gets from appropriately chosen limitations. For example, the single HPF and envelope on each oscillator with a common envelope for the LPF is useful combination for this synth that gives you flexibility where it’s useful but keeps you grounded in where this synth shines. It’s pretty hard to make this thing sound bad and the well executed U/I is the icing on the cake. There is this constant awareness that someone is turning the wheel for you which makes it very special. Very focussed on the mid frequencies, sometimes I miss some deepness. But when I want that, there are other ways. Very well executed! Hurray! RR makes great instruments, but their Laboratory is a great place to find weirdness. Platter is great for creating string parts. Weird string parts. And that’s before you really go twiddling with the knobs, which puts you into very weird territory. Very much fun stuff. My first impression of Platter was: “this sounds fantastic! I just wish there was more of a variety of source sounds…”. Next thing I know, I realize that an hour has passed, I’ve been playing non-stop, I’ve got ideas recorded for a couple new tracks, and I haven’t gone through half of the presets yet. Platter is actually capable of producing a wide variety of sounds, from organ-ish to chimes/EP-like, from strings to flute to fuzzy synths. I am also really impressed with how the sound can evolve over time — from short and plucky, to long and evolving soundscapes, with different elements coming out over time. My first impression was wrong — once I listened beyond the obviously limited-bandwidth and crusty overall character of the sound, I discovered a world of beautifully cronky possibilities underneath. 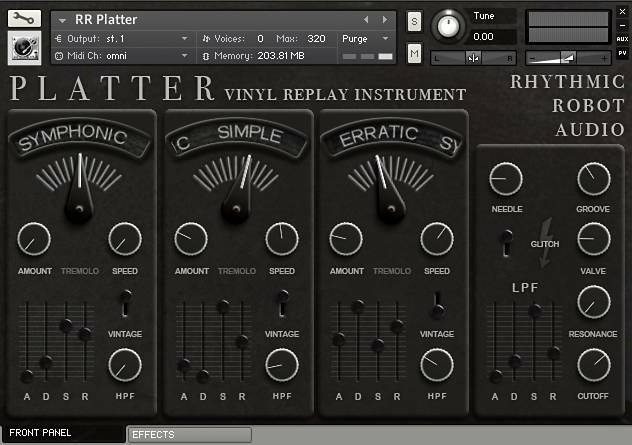 Platter is still definitely a niche instrument, but it is excellent at what it does, and its got a few tricks up its sleeve. I Like This. As an owner of a hand cranked 1910 turntable just like the above, I say you’ve captured the filth with aplomb. Five Stars! ! !